Moorgate station is a central London National Rail and London Underground station in the City of London. It is on Moorgate, north of London Wall. At one time the station was named "Moorgate Street". It is the central London railway terminus for suburban First Capital Connect services from Hertford, Welwyn Garden City and Letchworth. Until March 2009 it was also a terminus for trains on the Thameslink line, also run by First Capital Connect. It is the site of the Moorgate tube crash of 1975 in which 46 people were killed and 74 were injured. The Underground station is on the Bank branch of the Northern line between Old Street and Bank, and also on the Circle, Hammersmith & City and Metropolitan lines, between Barbican and Liverpool Street. Entrance on Moorgate, the eastern side of the main building. There is another exit on Moorgate, directly opposite. Northbound Northern line platform looking north. Roundel on northbound Northern line platform. Northbound Great Northern (First Capital Connect) platform looking north. Note 16 ft (mainline) diameter tunnel ahead. Station sign on northbound Great Northern (First Capital Connect) platform. Note old Network SouthEast style. ↑ 1.0 1.1 1.2 1.3 1.4 1.5 1.6 "Multi-year station entry-and-exit figures" (XLS). London Underground station passenger usage data. Transport for London. March 2017. Retrieved 25 June 2018. ↑ 2.0 2.1 2.2 2.3 2.4 2.5 "Station usage estimates". Rail statistics. Office of Rail Regulation. Please note: Some methodology may vary year on year. Wikimedia Commons has media related to Moorgate station. 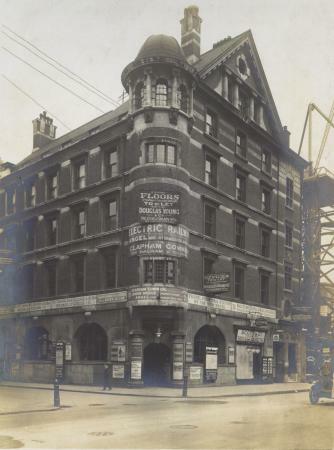 London Transport Museum Photographic Archive Moorgate station building in 1915. This page was last changed on 22 November 2018, at 13:21.